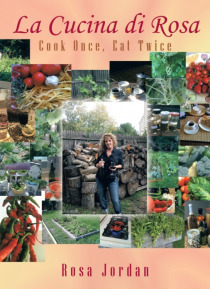 My idea of cooking is in large quantity, so there is always extra to make that second meal, this is what my book is about Cook once, Eat twice, so you still get that second dish while saving time and money. Also in some of my recipes I provided a way to substitute certain ingredients and still get that fantastic meal. Dont forget to check out the specialty and tip pages with all my little cooking… secrets. My past is full of family who loved to cook. My Italian Grandma from Italy love to cook turning her home into a small restaurant where she would entertain people who love great homemade cooking. I grew up on a farm where times were tough, tomatoes and vegetables were plentiful, so I would help my Ma cook and jar sauces and jams for those cold winters. Those traditions Ive passed onto my children. Holidays were and still are big celebration with my family and friends stopping over for homemade food and drinks. I always enjoy seeing their expressions and when they asked whats in here its delicious!! Still to this day, my children and I have our Sunday Family Dinner. We get together, cook and discuss the weeks events. In our family we believe A family who cooks together, eat together, stays together! The recipes in my book are mine and my familys favorites. I hope you make them yours! !